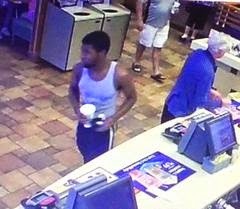 On June 26, 2014 the victim was inside the McDonalds restaurant on the White Horse Pike (US Rt. 30) in Absecon. She placed her wallet on the counter next to her while placing an order. She mistakenly forgot when she left, but returned shortly afterward to find that it was gone. 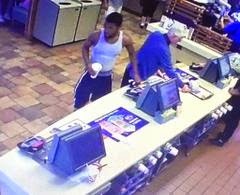 Police reviewed surveillance and observed a black male wearing a gray tank top and dark shorts approach the counter after getting his own order. He then grabs the wallet and exits the store. The wallet contained cash, credit cards and several forms of identification. The Absecon Police are asking for the public's assistance in identifying a theft suspect. If anyone has any information regarding the identity of the suspect, please contact the Absecon Police Department Detective Bureau at 609-641-0667 Ext 216, or Crimestoppers at 609-652-1234 or 1-800-658-TIPS. can pix be blown up some ?? Download them to your computer and zoom in.